A heavily chained “Unchained” melody, Axis: Thrones Of Love is the slow aural psych-pop gem that sets off Outside Love, singer Stephen McBean’s dysfunctional heart swelling lament, chemically soaked in Leary-ian utopia. 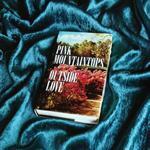 Pink Mountaintops, side-project of Black Mountain frontman McBean, unites a heap of his Canadian/indie music peers and Black Mountain coconspirators in an effort to aid in his exper-romantic vision, the velvet swaddled novel on Outside Love’s cover as amusing as it is appropriate. With somewhat of a lean toward the sonic panes of Kevin Shields, the Velvet Underground and Phil Spector, a mostly blossomed 60s throwback nature come calling, Outside Love seems not so much about making love as it does about aching love, its heart’s blood pooling around Cupid’s arrow. With doolang doolang blankets of odd cheer propelling Execution (“Well, I would fight to stay your execution/Well, I would die to save your soul”), slowed down by singer Ashley Webber’s lovely vocal in While We Were Dreaming (“And if I could find your heart/I would pull it from your chest/And smash it with my fist ‘til it was beating”), the collaborative Pink Mountaintops make efforts to utilize the gifts of its contributors, though McBean ably plays traffic cop. Outside Love, in all its varied flavors, textures and patterns, is focused. Even when the hippie dirge (Vampire) commingles with the hippie cheer (Holiday), imagined fireside acoustic jam and camp time sing-a-long exhaling THC-saturated CO2, McBean’s intent is always at the album’s core. The lethargic energy of Come Down precedes the smartly sequenced title track and country twanged And I Thank You, Outside Love’s duel highpoints the perfect culmination of its previous output. Sweet Hereafter singer Jesse Sykes, Ashley Webber and Godspeed You! Black Emperor’s Sophie Trudeau combine cascading and lush angelic harmonies overtop unsteady near-whispers for Outside Love, an engaging mix of warm meets cold, distant echoing whistles and pulsating fields of disarray contextualizing its desolation. A dance club bit of Velvet dubbed The Gayest Of Sunbeams offers up the last bit of energy before Closer To Heaven ends the album in southern-flavored violin strings and tambourine, igniting another joyous outpour from the album’s personnel. Outside Love carries with it a romantic spirit that seems neither romantic nor spirited, but is instead poised to express meaning through eyes that have seen and experienced the darker side of the heart. Acknowledging that blood keeps the heart beating while noting that blood also symbolizes death, Pink Mountaintops strive to be somewhat realistic without seeming tragic, skeptical without appearing cynical. There’s as much joy in heartache as there is in love because, when it comes down to it, the heart lives on. So, celebrate; romance novel be damned.